The immediate past Chief of Defence Intelligence Monday Riku Morgan, AVM( Rtd) has won the 2016 Good Governance and Leadership Man of the Year Award. According to a statement by the Secretary General, Coalition for Good Governance and Leadership in Africa Mr Olajide Morolayo said, the former intelligence czar clinched the prestigious award for his contributions towards national Security and good governance in Nigeria in particular and Africa in general. Born 56 years ago ago, The Marshal started his primary school education in Wesley Central School Otukpo in 1967. After the successful completion of his primary education in June 1973, the senior officer was admitted into Wesley High School Otukpo in September 1973 to start his secondary education, which he completed in flying colors in1978 as a division one student in 1978.Air Vice Marshal Morgan thereafter passed the entrance examination into the prestigious Nigerian Defense Academy to commence his military career as member of 25th Regular combatant course in January 1979. He graduated from the defense academy in December 1980. The Marshal though a pure arts student ventured into the area of science as he was enrolled into the Primary Flying School Nigerian Airforce base kaduna to start his ab- initio pilot training in 1981. After graduation in 1982 he proceeded for his basic flying training and graduated as full winged pilot in1983. The senior officer because of his performance was qualified therefore to be further trained as a fighter pilot. In a class of 13 of 25th Regular course(Airforce) the marshal became the only fighter pilot of that course. The senior officer,full of combat experience from Ecomog, then a squadron leader was to be trained as a qualified fighter instructor. This responsibility was to give to the younger pilots his experience in art of flying. He has produced so many pilots for NAF some who today are Air commodores. 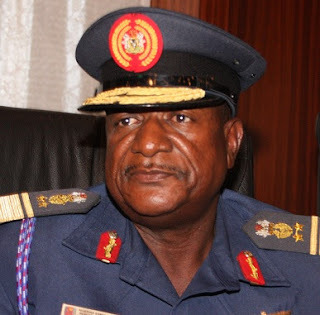 Air Vice Marshal Morgan was amongst the team of NAF pilots that ferried fighter airplanes from Germany to Nigeria in 1990 in preparation for the Ecomog air operations. As a daring fighter pilot Air Vice Marshal Morgan has participated in several operations in Nigeria and outside the shores of this country. He was one of the daring fighter pilots that fought in Liberia to defeat the rebel Charles Taylor to bring peace to Liberia. He also actively participated in the air operations in Sierraleone to extricate the sierraleonians from the grip of Foday Sankoh the rebel leader that ultimately led to peace in Sierraleone . Immediately after his tour of duty in Ecomog, the senior officer as a squadron was sent to Angola for the peace keeping operations. He was made the chief air support officer (CASO)of the operations with about 15 UN airplanes under his command. Apart from his military training the Senior officer has attended other none flying courses like a diploma in Aviation management obtained from the UK , Officer selection process course also in Uk and the Peacekeeping Management course in Tershie Ghana. He was also a part of a NAF team to the Malaysian air show in 2010. These were part of the senior officer,s tutelage at his intermidate ranks. a. Chief flying instructor 303 flying School Kano . Forces of the federal Republic of Nigeria. Air Vice Marshal Morgan has visited so many countries during his military service which includes USA, UK, Germany, Russia, China, Norway,Sweden, Denmark, India, Malaysia , Brazil , the Caribbean, Netherlands including African countries like South Africa, Zimbabwe, Namibia, Lesotho and many others. The senior officer is married to his beautiful wife Dr Regina Morgan a chief medical consultant and Head of Department of ophthalmology in the National Hospital Abuja. They are blessed with 3 children. Morgan, a Professional Combat pilot having risen to the highest rank of a chosen career with unblemished records, having been part of positive projections of Nigeria outside Africa, is worthy of this honour. The statement added that, the Award shall be presented to him in Abuja.